Same here. Horrendous speeds from about the same time for me too. Hmmm, all slowed to an absolute crawl here too ... is it worth raising a ticket with Bigpipe, or just wait for it to get resolved itself? Doesn't hurt to report I guess. At least they'll know how many people are being affected. Just done a test now, and it's still crawling along at around 5 to 6 Mb/s. Normally by this time it's picked up, but not tonight. The slowdown started earlier too at around 11am. Been in single figures since then. Great to see that bigpipe has been proactive with this issue. Looks we've had about a dozen or so cases of this, and whilst there will always be people having the issue who don't submit tickets, that does indicate it's a very small subset of people on our network. We're pretty confident there is nothing at our end, and, seeing other threads from other ISPs and talking to people at Spark and VF it does seem likely to be a Chorus issue. We've escalated it with them, and hope to get some results soon. I suspect a lot of ADSL customers won't have even noticed. 5Mb/s it quite usable. Netflix works okay for me for example. If it hadn't been for this thread I wouldn't have checked and linked it to a couple of niggling issues I'd been having. Anyway I'll log a fault when I get home and add my data point. 3) We've also heard from colleagues at Spark, VF, and other ISPs that are experiencing the same issues with a small subset of their DSL customers. 4) In the meantime we're starting a process to reach out to customers on the same DSLAMs and cabinets/exchanges as the ones who reported the speed issues to see if they are also experiencing problems (many people don't report issues, so we're trying to be proactive). It will help cement the precise locations e.g. if we get responses from these customers that they are seeing the same problems, it means that location can be identified as a problem area. "Ratcliffe today said that uptake had exceeded most people's expectations, with the recent introduction of Netflix's streaming video services helping underpin some of that growth. While there has been reports of congestion slowing down internet service on Chorus's copper network during peak usage times, Ratcliffe said the fibre network was unaffected." Here's hoping it'll be a quicker fix than 1 or 2 months mentioned though. It's got to a point now that I can't stream Netflix / Spotify, etc without crappy buffering issues every few seconds. One thing I don't understand though is the sudden drop in speed. I would have expected a slower decline, but mine has been almost overnight (from 50Mb/s down to 5Mb/s on an evening). Smells fishy to me. This doesn't explain the sudden onset of the slowdown or the jumps in latency I'm seeing. Also if Chorus know where the congestion is, why can't they just tell Bigpipe so they don't have to guess. Tinfoil hat time. Chorus have been caught out by Netflix and unlimited plans and their response is to divert bandwidth away from the copper network to ensure no bad coverage of the politically sensitive fibre network. Ties in nicely with the quote from the herald article. hashbrown: Smells fishy to me. This doesn't explain the sudden onset of the slowdown or the jumps in latency I'm seeing. Also if Chorus know where the congestion is, why can't they just tell Bigpipe so they don't have to guess. Your tinfoil has needs resizing. Copper and UFB networks are completely separate. And as for Chorus being caught out by Netflix - that's entirely possible.. But you should remember it was Chorus last year telling the industry that usage would explode this year with video and they offered Boost HD ADSL2+ and VDSL2 plans to the market with higher dedicated CIR far in excess of what current EUBA plans can offer. The response from the industry and the Commerce Commission was to basically tell Chorus where to stick it. People have to understand that copper is still a best effort service and that the performance most users get on EUBA is far better than the Commerce Commission regulated UBA offering. I have submitted a ticket as well. 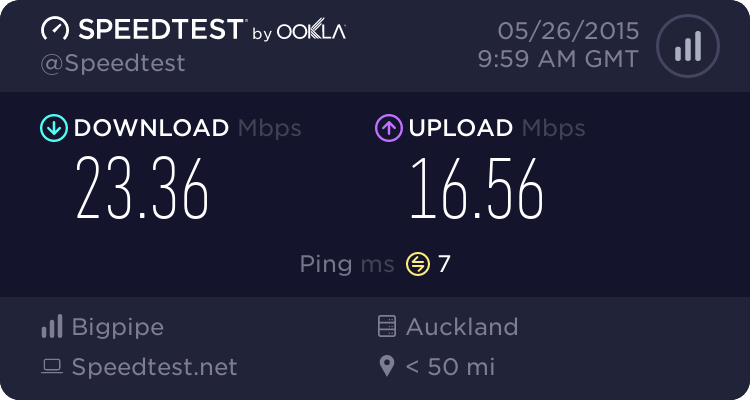 I am based in Ellerslie, with ping drops and download speed drops in evenings (not sure about daytime during week as not home). Generally improves around 11pm. I notice this as I game online in the late evenings and ping time has had a noticeable change in the past week. We believe the UFB network is not affected by this, so your problem is (probably) something else. Best thing is to send our team a support message and we can investigate. b) they are actively making changes to their network that are negatively impacting customers. If Chorus aren't going to front and admit to case a, we are free to wildly (and admittedly mischievously) speculate on case b.
I welcome any other explanations as to why this breaking was an overnight event, but fixing it will take a couple of months. If there was a hypothetical situation of an ISAM 1Gbps uplink being saturated by VDSL2 users it's something that could easily happen overnight. I'm not sure however what the fix would be.